One of the best ways to gather valuable information about your customer base is by using eCommerce customer surveys. You can use the thoughts, feelings, and opinions of people who have already made purchases to strengthen your operations, customer service, product development, and, of course, your marketing. After all, 70 percent of customers will buy more products or services from a merchant if they have a positive experience, and on the flip side, 91 percent of unhappy customers will not willingly do business with you again. Sadly, many brands fail to survey their customers (or reach out to them with other techniques, like phone interviews). They know the importance of understanding their customers, but they neglect to get their knowledge straight from the source. Surveys are valuable because they let you tap into information that isn’t available through your web/store analytics, social media pages, or email marketing tool. Surveys get into your customers’ minds. There’s no limit to what you can learn. You won’t get good survey responses if your customers can’t or won’t access the survey. To get the best responses, your first task is to make sure everyone can load the survey page, whether it’s on your site or the site of a third-party tool. Part of being accessible means your eCommerce customer survey should work well on mobile devices. A sizable portion of customers access the web exclusively through mobile devices. How do you design a mobile-friendly survey? Make sure questions fit the screen. Don’t include images, unnecessary styling, or anything that will increase the page load speed. Break long forms into multiple pages so respondents don’t have to scroll much. Limit the number of possible responses so they all fit on the screen at the same time. Avoid using dropdown elements. They can be hard to use with your fingers. Next, consider how people will find or be invited to participate in the survey. 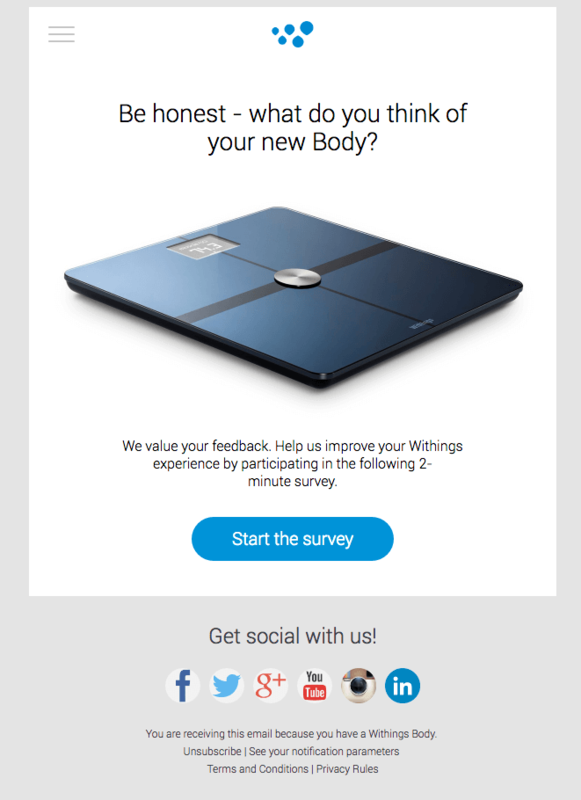 Prompt your customers to complete your survey with a post-purchase email. Withings is a great example. They email a link to a survey a few days after the customer receives their order. The link in the email goes directly to the survey and it reaches every single person who makes a purchase. The timing is important. If your survey questions are about experiences with a particular product, or if you want to ask about things like customer satisfaction with your shipping process, it’s important to make sure the survey reaches the customer after they’ve had a chance to experience those things. Similarly, if you wanted to gather insights about your customer support, it would make sense to send a survey after an issue has been solved, not while it is still open (or even worse, randomly to customers who may not have interacted with your support team). According to Nielsen, 79 percent of web users scan web pages. They hunt for keywords and words that have specific meanings to them. Few people read everything they come across. If you want people to complete a customer survey, it’s important to keep your questions short and to-the-point. Ask straightforward questions that are easy to understand and only interpretable in one way. Furthermore, reduce the number of questions as much as you can. Customers are more likely to answer short surveys than long ones. Plus, long surveys bore participants, which means they’re apt to throw in any answer just to finish quickly. 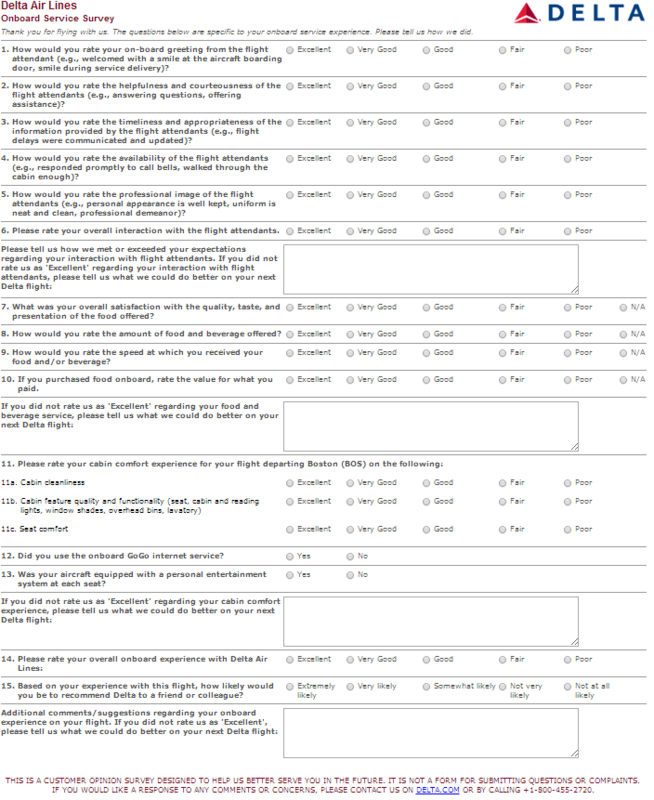 Here’s an example of a bad customer survey. Only the most motivated (i.e., incentivized) customers will fill out something like this. It looks like homework! It helps to have a specific objective for each survey so you know what to focus your questions on. For instance, you might design a survey on product satisfaction or a survey about the checkout experience. 1. Dichotomous response scales present two choices, like yes/no, true/false, or agree/disagree. This is a dead-simple question, but there’s no room for nuance. 2. 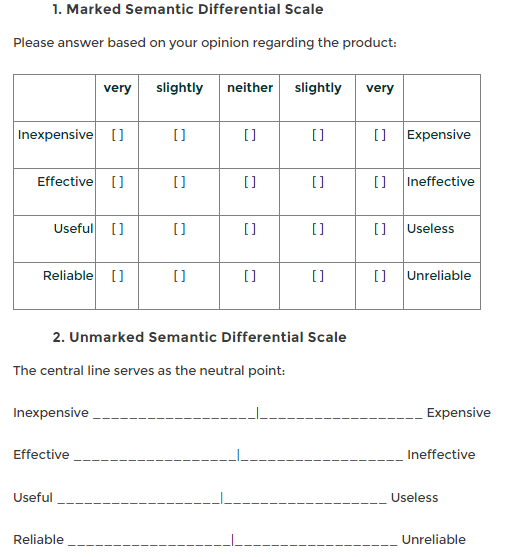 Rating response scales offer a range of numbers where you match the ends of the scale to opposite responses. You might say, “How would you rate your experience on a scale of one through five, with one being poor and five being great?” You can use any size scale, though one-to-three, one-to-five, and one-to-ten are the most popular. Which type of response scale should you use? It depends entirely on the type of data you want to collect. If you want to know about actions (like “Do you purchase gifts for friends?”), dichotomous response scales can keep things simple. But if you want to know how people feel or would behave in the future, experiment with the other two response scales. For non-measured questions, such as, “Where else do you shop?” or “What other brands did you consider?”, other response types will make the most sense (in those examples, a multiple choice list probably works best). You’re close to your brand, so you may find it difficult to keep your own personal bias out of your survey. It’s important to stay neutral, however, because biases can influence your results. That question implies the customer enjoyed the product at least somewhat. If they didn’t enjoy the product at all, there’s no way for them to answer the question. Even if you provide a response option like, “Not at all,” the phrasing of the question is leading and could influence the answer provided by the respondent. People have the tendency to select the first reasonable choice in a list rather than read all the options (part of the primacy effect), especially when they want to get through the eCommerce customer survey quickly. Randomizing the options keeps them on their toes. For instance, they won’t be able to trust that the first multiple choice option is always the positive one. Colors, fonts, styles, images, and even layouts mean different things to different people. They can even affect how people feel at that moment, which could disrupt your data. Keep your eCommerce customer surveys minimal and clean. It helps to order your questions in the same way your customer experiences your store. So the first questions should ask about how they found your store. The next questions should focus on the browsing/shopping experience. And the final questions should ask about checkout and the product. This puts the customer in the same frame of mind when they made their purchase. Control confirmation bias by constantly re-evaluating what you ask and how you ask it. Do your questions lead people toward what you want to be true? Should you offer an incentive? Incentives are powerful tools to get your customers and fans to do something, like subscribe to your list, visit a landing page, spend a little more money, or fill out an eCommerce customer survey. But you have to be careful. You may not care about the cost, but that’s not your only concern. Some will throw in whatever answer is easiest to click or type without reading the questions, just to get through the form quickly. Others may give overwhelming positive answers because they think that’s what you want to hear. And a percentage of people will be unnecessarily mean because… trolls will be trolls. That said, you may struggle to find participants if you don’t give them anything in return, especially for longer or more involved surveys. Some people need tangible motivation to interact with a brand. So should you offer an incentive to get your customers to complete an eCommerce customer survey? It depends entirely on your customer, which is another reason why creating buyer personas and understanding your customers’ jobs-to-be-done are so important. If you don’t know yet whether an incentive is appropriate, test by offering an incentive to half your customers and not the others, or by offering an incentive on one survey but not the next. Monitor your response rate and gauge the survey responses to find out which method is more effective. Rather than ask your customers to reply to your emails with their thoughts, use a specialized survey tool to simplify the process for you and them. Link directly to the survey from your email marketing messages. You don’t need your customers to go back to your site. You just need them to complete the survey. 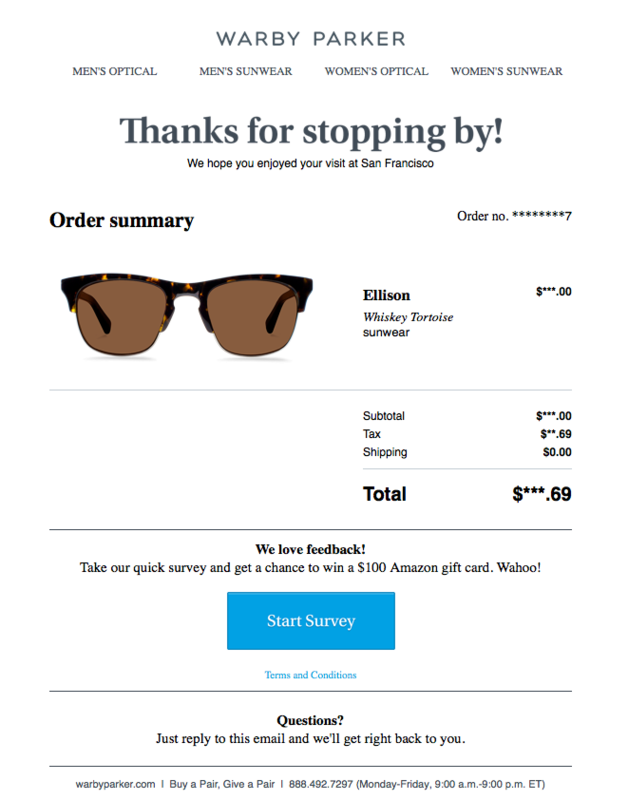 Warby Parker includes a survey button with every order confirmation. This maximizes their response rate and gathers data while it’s fresh in their customers’ minds. What you ask in your eCommerce customer surveys depends on your goal. Are you trying to gauge customer satisfaction with a specific product? Do you want to know more about experiences with your customer support, shipping, or returns procedure? Are you trying to uncover insights about your website design or learn why people abandon carts? Determining the goal of your survey and what you want to learn will influence the questions you ask and how you target and reach respondents. Below is list of basic questions to include in your eCommerce customer surveys. These questions assume a general survey for all customers in which you’re trying to learn more about their motivations for purchasing from you. Use these as a starting place to design your surveys. What convinced you to buy from us? What other options did you consider before you bought from us? Were you unsure about anything when you made your purchase? What are you using our product for? What problem does it solve for you? What do you like about our product the most? What information could we have provided to help you make your decision? How satisfied are you with the breadth of selection in our product/service line? How satisfied are you with the design and functionality of our website? How happy were you with our shipping and delivery time and process? Do you feel like we gave you enough information about your order? Which features of our product are most valuable to you? What’s your preferred method of connecting with us? Is our return policy fair? Do you think our prices are fair? If you could change one thing about the product you purchased, what would it be? How much effort did you have to put forth to shop on our site? What was your experience with our customer service? Did you have any problems with the checkout experience? What other items would you consider purchasing in the future? Online surveys are a great way to gather quantitative data, but that only gets you so far. 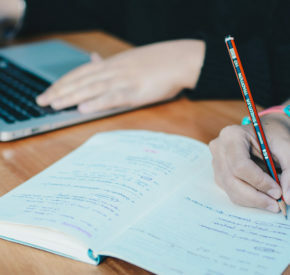 Because you should avoid asking too many open-ended questions, and limit the number of questions that require text input in general, it’s hard to learn qualitative insights about your products, website, services, and policies. Think about it, if you ask a customer, “Is our return policy fair?” and they choose, “No” that gives you a data point that indicates you may need to make changes to your policy, but not much insight into what you should change. You could ask them for a longer response about why, but many users will not spend the time to provide useful details. It can be difficult to get people to complete longer surveys. But what if there was a way to ask just one question and still glean a weather of useful information from your users. One such method is to use Net Promoter Score (NPS). NPS is a simple way to gauge overall customer satisfaction and loyalty by asking a single question: how likely are you to recommend our product [or company or store]? Just from that single question, you can calculate a score that gives you a valuable directional indicator on whether you’re doing the right things you keep your customers happy. Sometimes a follow up question (like “why or why not?” or “what you enjoy or dislike?”) is asked to gather even more info, but all you really need to figure out your NPS is that first question, asked regularly, over time. Getting the best data from your customer surveys means being thoughtful about the questions you ask. Slight changes to question or option wording can create dramatic changes in your results. Consider your survey carefully and you’ll be rewarded with valuable insights that make your business and marketing stronger.